The book was amazing. 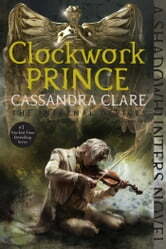 I can't wait for the clockwork princess. These series are one of my favorites. It made me laugh and cry with the characters. Cant wait to start the next book. Most excellent. Love the historical references and quotes at the beginning of each chapter. The adventure continues for Tessa Gray, Will Herondale, and James Carstairs. As they chase after more clues to find out who Tessa really is and why The Magister so desperately wants her. New twists and turns for these three, and the other characters introduced in Clockwork Angel, make for a spell-binding adventure. NEW OBSESSION ALERT! I am officially obsessed with Will Herondale. Also, I am officially obsessed with this The Infernal Devices series. I loved Clockwork Angel and cannot wait to get my hands on Clockwork Princess. Every time that I think there is finally a time to breathe and regain composure throughout the book, I am catapulted into another spinning plot twist. The depth of not only the plot but each character (and there are quite a few) is immense. I have not read a book in a long time that has forced me to react outwardly. The world that Cassandra Clare creates is entirely consuming and it became difficult to separate myself from the book and reality. I want to be part of Tessa, Jem, and (most especially) Will's world. It is gripping, encompassing, and unpredictable. I root for these characters, I hope for these characters, and I grieve with these characters. I have found this series to be riveting and invigorating! Although I have only read 2 of the 3 books in this series, I highly recommend the series to those who love action, betrayal, romance, and fantasy. I think it is appropriate for readers over the age of 16 and I recommend it for those seeking adventure. On the other hand, I would not recommend this book for those who do not appreciate betrayal, violence, manipulation, demons, magic, love triangles, unrequited love, or drug addiction. Furthermore, I would not recommend this book for readers who have not read Clockwork Angel yet, as it would be very confusing. Lastly, I listened to this book on AudioCD. It was read by Heather Lind and Ed Westwick. More than half was definitely read by Heather Lind, who was fantastic and gave a unique voice to each of the many characters. Additionally, I also really enjoyed listening to Ed Westwick read the parts when it was in Will's perspective. His deep, sultry voice, made Will's character even more alluring.